Latest post Fri, Sep 2 2016 1:39 AM by erwabo. 13 replies. I recently built an Avid Adrenaline HD rig (dont ask) Looking around on Ebay I saw something called an Avid AirSpeed...which looks like a rather neat device. This was before my time doing video I think, but does anyone know if this can operate as a stand alone without having an Avid Unity Engine on the network. The manual said it can use internal drives to record video? It seems to have quite a few "requirements" but seems like it could possibly act as a stand alone. I noticed the Unity ran Windows 2003 server, which makes me wonder if I have a PC with attached storage and was running the Unity Software, would the AirSpeed pick up on it? I asked one of our engineers to provide some guidance on your posts.
" First thing to note: With Airspeed now known as ‘Airspeed Classic’ support ended in June 2015. Second, Avid Airspeed, as he recalls, can be configured in a ‘standalone’ mode with an editor by installing and configuring a Transfer Manager on the editing system, along with TM Client. You could then set up the Transfer Manager to use FTP and target the Airspeed for manual transfer in either direction. This was a traditional workflow, and configurable via Airspeed UI and editor settings.... and patience. It can manage record of SD-formatted media (NTSC DV25/50, IMX30/50, PALDV25 422/420, IMX30/50, etc) and DNx HD when used with a DNxchange device. It also allows for two playout channels and basic OSD monitoring. Thirdly, as far as tossing a Unity setup into the mix, there ‘may’ be a way to get things going, although not any more convenient. In that case, you’d still use the Transfer Manager to move media via FTP, and the editor would use workspaces rather than local storage to locate things. There may be some configurations that could be made under-the-hood to get the Airspeed to connect to Unity workspaces, while still working with the editor directly, although this was never supported (it fell into the ‘I got it to work’ bucket of workflows, which isn’t exactly confidence-building). This typically might involve manual editing of TM.ini files, config files, and modifying running processes on the Airspeed via command-line. Not for the faint-of-heart. Versioning, traditionally, would be worth verifying in this case, also, where the version of the editor is likely tied to a version of TMClient and Transfer Manager. Any deviation could cause issues. Lastly, at any rate, he can see some sorts of configuration/workflow that may have value in this case, however there are likely a few ghosts in the machine in setting things up." 1.DNxchange. Would the Adrenaline HD suffice since its got the DNxHD Card in there? 2. What would be my workflow with Avid MC Adreanline HD with an AirSpeed in the mix. Would Adrenaline still be my primary capture device and AirSpeed more or less storage/archiving/media drive? Also, does anyone have a copy of the AirSpeed software and Interplay Transfer. I may be wrong, but I dont think the AirSpeed software was hard coded onto the device itself. It used to be in the Avid download center but thanks to the wonderful Java licensing changes, I can no longer get it there. Wayne wanted me to let you know that it is always excellent to hear from the outside world!
" Thanks so much for the detailed reply. Also just so we are on the same page, I am talking about the AirSpeed with the screen on the front of it, not the multi stream...which according to the manual , supposedly a Unity is supported, but thats way before mytime =)"
Assuming that the Airspeed isn’t intended to record or playback HD media, Adrenaline can do whatever is needed. Airspeed would need the additional DNxchange device to record/play HD/DNx media.
" 2. What would be my workflow with Avid MC Adreanline HD with an AirSpeed in the mix. Would Adrenaline still be my capture device and AirSpeed more or less storage/archiving/media drive?" 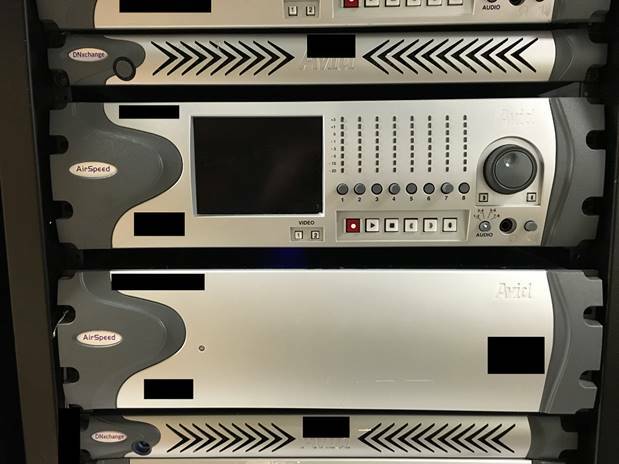 There are options here—you can record baseband SD-SDI media with either device, playback with either device, and also can have access to storage via the Airspeed. It remains a device that can record and play SD video. Thanks, that makes sense. So, is the actual AirSpeed Software/OS built into an onboard logic board, or is this a standard Windows 2003 system with AirSpeed software installed on it? If so it would be almost entirely usless to buy one because I have not found that software available anywhere. I supposed with a FireWire deck attached to the Adrenaline, I wouldnt need an Airspeed at all, but they are well priced compared to the decks (with playback screens)I have been eyeing. Im just wondering if I buy one of these on ebay with no software, Will it be useable? Does anyone know where I can get the older versions of the Interplay Transfer Manger? More specifically for MC 2.7 and 5.5.3? "Second, Avid Airspeed, as he recalls, can be configured in a ‘standalone’ mode with an editor by installing and configuring a Transfer Manager on the editing system, along with TM Client. You could then set up the Transfer Manager to use FTP and target the Airspeed for manual transfer in either direction. " Where can I get the TM and the TM client now....its no longer available on the Avid site. I have MC 2.7.7 and MC 5.5.3 so i beleive I would need that same version. Im guessing without that, the Airspeed Classic is useless? Consult the ReadMe and all Interplay Production V3.5.x documentation on the Knowledge Base. THanks so much for your assistance and for Avid support help. Unfortunatley due to support ending June of 2015, they are unable to get me an .ISO for Airspeed Classic and without a Unity Engine, I am unable to procure a copy of that. My only option at this point would be to find someone with a copy of the AirSpeed .ISO or purchase a Unity Engine...lol. I HAVE seen them for $500 on ebay, but rare to find one with the Unity License and Software as well. SOMEBODY must have a copy of the .ISO...thus the search continues. I think one of your colleagues accidentally posted as me (I was having issues with my account and they did a test with my login). Can you raise that with whomever you think it was? I have not, I will have to look into that. I was also going to purchase a Dnxchange, but I dont think it works with Airspeed 1.0. I noticed Dnxchange was mentioned in the manual for Airspeed 2.0. It SEEMS like in theory it would work (may be unsupported) but no mention of Dnxchange in 1.0 manual...so not sure im going to be able to do a ton with this 1.0 anyhow. Workgroup Transfer mode couldn't be determined! The Transfer Manager Server "asplay-2" may not be available. GetTMParameters returned 4 - tmParmValue="NULL" tmParmType="NULL" serverName="asplay-2"